This entry is part 9 of 11 in the series Creating My Smart Home. At this point in my Home Assistant journey I have several devices configured, and the UI is starting to get cluttered. 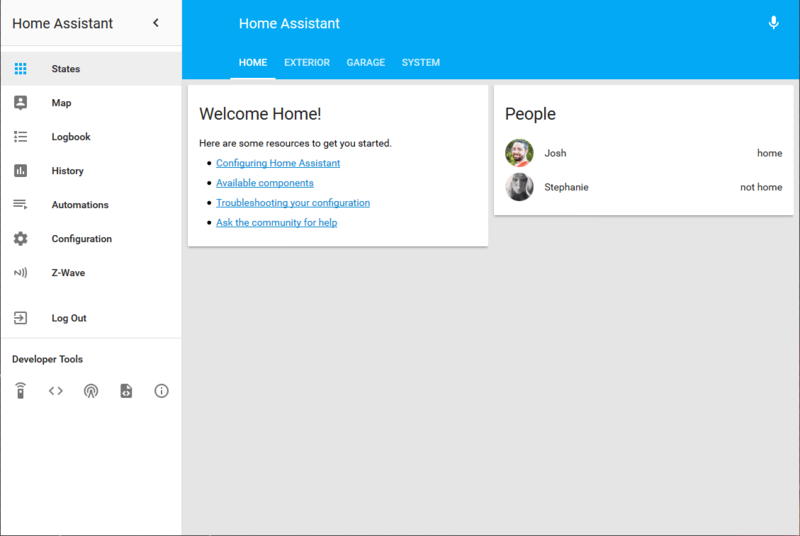 Home Assistant lets you organize the UI using groups and views, so I decided to take advantage of that. I want to have a few tabs (a.k.a. “views”) with my devices grouped within the appropriate tab. I also want to hide some entities that aren’t immediately useful. My tilt sensor for the garage door, for example, has five entities listed in the UI right now. Some of them aren’t useful to me, and I have to visually scan for a few seconds to find the sensor and see when the door is open vs. closed. You’ll notice that the first entry is the default_view. 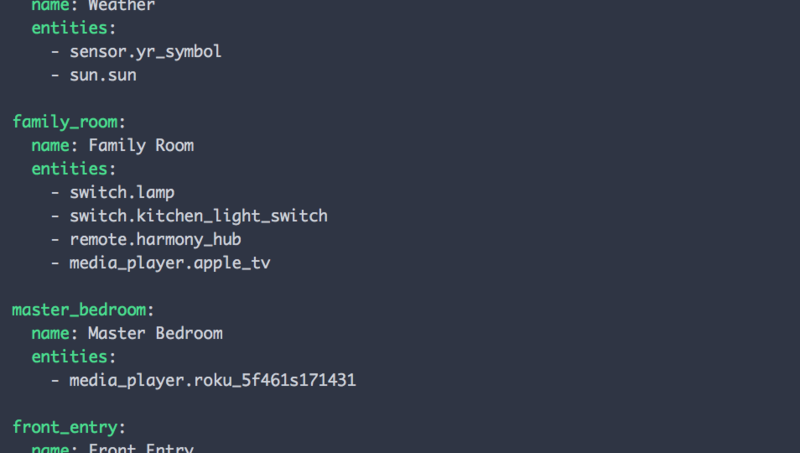 By creating a default_view Home Assistant will no longer show every entity in the web UI. When I add new devices/entities in the future, I’ll need to explicitly add the entity to the groups.yaml file in order to see them in the web UI. This is what I wanted, but others may prefer to have all devices added automatically to the default view; in that case, don’t create a default_view entry in groups.yaml. After I saved the changes to the file, I navigated to the Configuration section of the web UI and checked the configuration to ensure it was valid. It checked out OK, so I scrolled down and clicked the Reload Groups button. After editing the groups.yaml file, check the configuration and use the Reload Groups button to see the changes. After a couple of seconds, I navigated to the States section and saw the new tabs across the top of the screen. 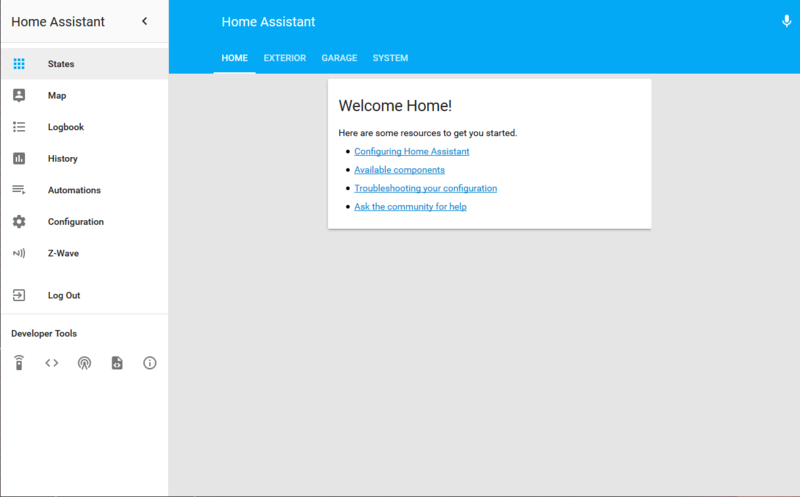 The Home tab still had the “Welcome Home!” group because my configuration.yaml file still had the introduction entry. I commented it out by putting a # symbol in front of the word introduction because I don’t want it in the UI at this point. Views are empty until you create groups and add them to the views. add each group to the corresponding view I wanted it to appear in using the view’s entities property. 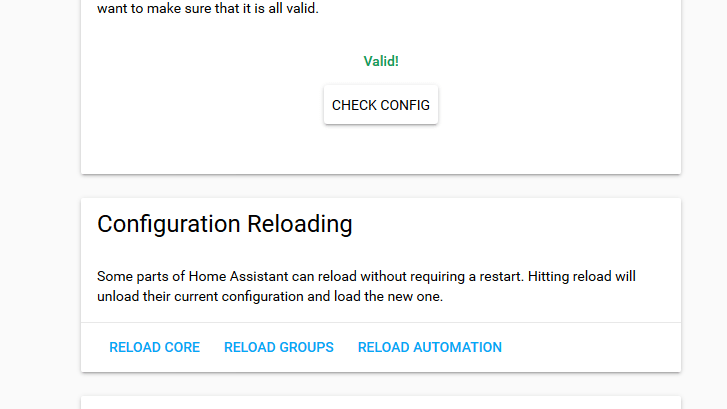 Home Assistant lists all of the available entities in the States page under Developer Tools. View the states page by clicking the “<>” icon under the Developer Tools. I saved the changes to groups.yaml, checked the configuration, and used the Reload Groups button to view the changes. Sure enough I had a People group in the Home tab. The People group is now in the Home view.